Welcome to our new series, "So You Want to runDisney!" 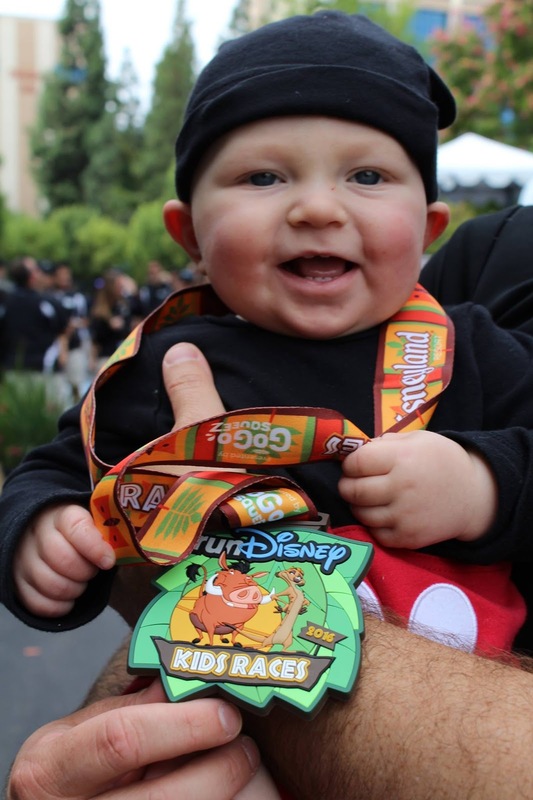 We have pooled all our resources to give you a one-stop shop of everything you need to know to get to your first (or second, or third, or...well, you get the point) runDisney race. 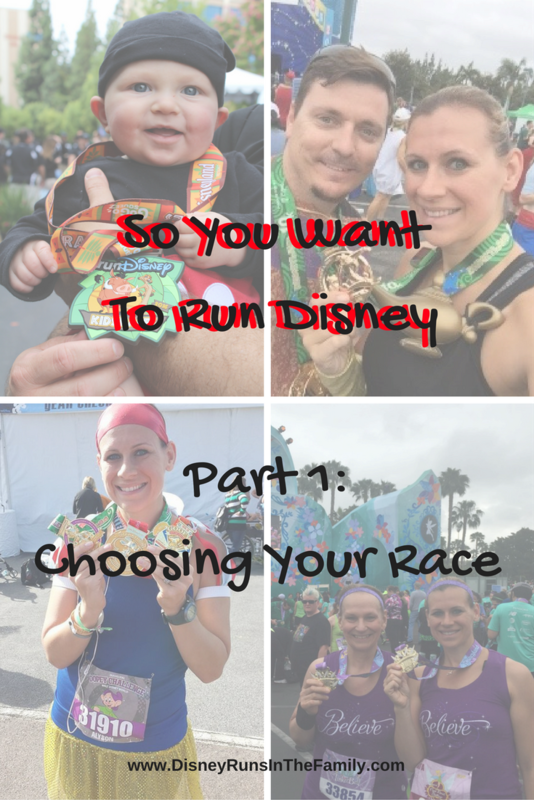 Yes, yes, this also applies to other races as well, but some of the information will be specific to running at Disney (we are "Disney Runs in the Family," after all). 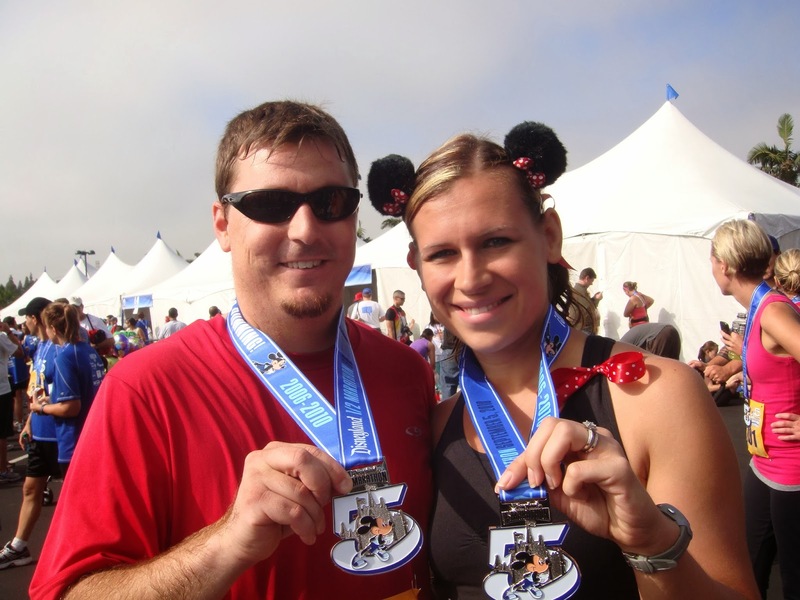 As runDisney continues to gain popularity, getting into a race can be just as challenging as actually running the race. Okay, maybe not, but it does take some planning and knowledge. For example, the 2013 and 2014 Dumbo Double Dares sold out in less than an hour! (Update: the hype is slowing down, but we'll give you the details later!) We don't want to add to the hysteria, but we do want to be honest. Especially if you don't have much flexibility in racing, we want to be sure you get into the race you want, but I digress. Before registration, you need to decide which race (or races) you are going to run! First disclaimer: just like every great company, runDisney sometimes makes changes to the race schedule to add, improve, etc. Some races, such as the marathon, have been happening for 25 years, so it's highly likely it will remain. Since we first published this series many races have been added: Superheros, Star Wars, and Paris--Oh la la--and even a virtual race series! I think the rumor mill has slowed now that these have been added, but no one knows for sure. As an aside, it's never guaranteed that a race will stay the same or even be there next year, so as long as your budget and health are in line, just jump in! How much time can I put into training? Typical training for anything over a 10k requires at least 3-4 months of a training schedule. Even a 5k and 10k take time, especially if you are starting from the ground up. Take a peek at the race dates--do you have commitments that would prevent you from training properly? You can guarantee that things will come up and you'll adjust, but if the thought of training through the busy holiday season sounds like torture, the January races are probably not the best bet. Don't forget about weather, too! We've now been on both ends: training in Las Vegas summers for the Disneyland Half and training for Tink in the snow. Definitely doable, but you should know what challenges lie ahead. Google search some training plans to get an idea of what you're really getting into. My favorites are Higdon and Galloway. I'm starting to look at Hansons as well. How far is reasonable based on my current fitness/running level? I'll be honest, my first race was a marathon. Would I recommend that? NO! But it can be done with proper training (and being 25 and in pretty good shape already). If you have never laced up running shoes, though, do that before deciding. Get in a few miles and decide if this is something you really want to do. I have people tell me all the time how much they hate running. Yes, it's shocking to me too, but it might not be your thing. 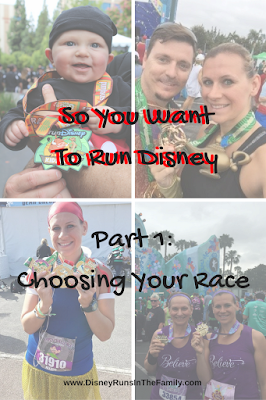 Do I favor one Disney park (Disneyland does not have a marathon)? What is my budget (race and run-cation)? Running at Disney is EXPENSIVE. There is just no other way to slice it! I wish it was cheaper, and it used to be, but with sell-outs happening at warp speed, there is no motivation for price decreases. For reference, my first Disneyland Half Marathon was $95 in 2010. For 2017, the Disneyland 5k is $80, and I just plopped down $330 for the Disneyland Double Dare. Don't forget to factor in travel expenses like hotel, airfare, and, of course, spending money. Dopey was all about running! Am I traveling to Disney to run, or am I running during a vacation? Huh? So let's break this down. Running at Disney is awesome, but it is very different than seeing Disney on vacation. Will you die if you travel to WDW and don't see Fantasmic, Illuminations, and the Magic Kingdom Fireworks? Do you expect to be in a greasy, sugary food-coma everyday? You just plopped down a ton of money (see previous question), so it's important to adjust your expectations. Races start early--like, really, really, really early! When I did Dopey, we only got a few hours in the parks each day, and there was no way I was staying up to watch a show. In fact, we were back in the room by dinnertime before the half and full. If you are not willing to compromise your vacation to run, the Dopey Challenge may not be for you. You can absolutely still run and have a great vacation, but consider this when deciding on which race to run. Also, don't forget about the coveted Coast to Coast medal! If you complete a half or full marathon in both WDW and Disneyland in the same calendar year, you receive a special Partners statue medal. It's beautiful, by the way, just to tempt you a little more. It is (gulp) at no extra cost to you! There is also the PINK Coast to Coast celebrating the ladies! If you run Princess and Tink half marathons, the pink one is yours. 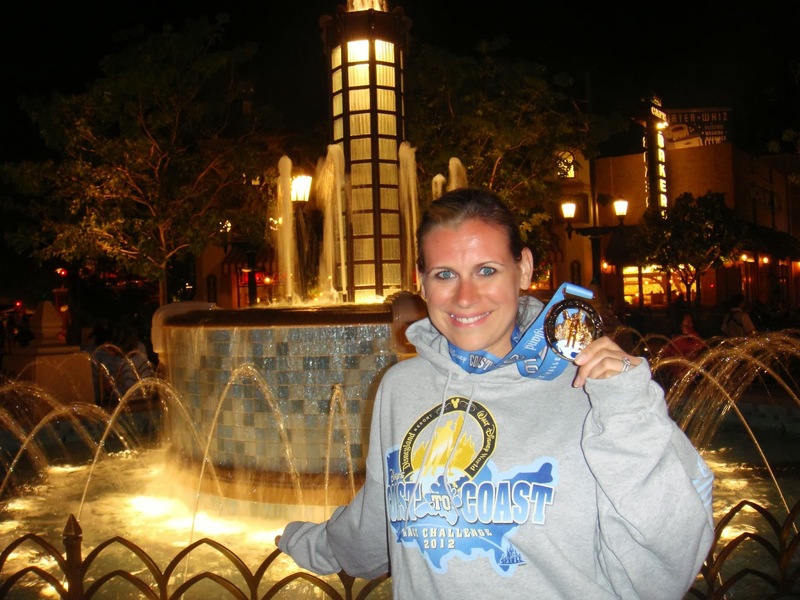 The Kessel Challenge special Coast to Coast is reserved for those who complete both Star Wars half marathons. Finally, if you are lucky enough to travel from France to the U.S. you can earn your Castle to Chateau. That one is definitely up there on my list of favorite medals!!! Caution: Running at Disney is addictive. Others may get addicted too. Lastly, let's not forget about the kids!!! Every race weekend also has an opportunity for the kids to get in on the action (even as young as 6 months). We are just starting to explore these races, but so far, we have been very impressed by the organization, pricing, and FUN that they put into these shuttle runs for the littles. It really speaks to us, because after all, Disney Runs in OUR Family!! !